Narrative notes—physician dictations containing in-depth detail of their patients’ care and treatment—are invaluable when it comes to providing effective care and are a key element of EHRs. However, sharing this information along a patient’s continuum of care has been nearly impossible without a single, agreed-upon data exchange format—but that may be changing. Recognizing the need to help accelerate EHR adoption and provide clinicians with comprehensive patient information in a timely manner, the Medical Transcription Service Consortium (MTSC) has been established to create a new IT platform for the secure exchange of digitized transcriptions of physician-dictated patient notes. Formed in conjunction with ICSA Labs, Verizon, and the Medical Transcription Industry Association (MTIA), the MTSC and its multidisciplinary team of charter members—MD-IT, MedQuist, MxSecure, Sten-Tel, and Webmedx—will develop a common framework for the seamless and secure exchange of personal health information among consortium members and their healthcare clients. The new framework will support structured narrative notes, which read like a text document but include XML tags that unlock valuable data, enabling both the narrative note and clinical data to be imported into an EHR. Jay Cannon, president and chief operating officer at Webmedx, says the consortium presents a great opportunity for the transcription industry to create an interoperable network and comprehensive standard for information exchange. “As we move to the full deployment of the EHR, medical transcription continues to provide value in regard to enabling physician usefulness, security, and interoperability between systems,” he notes. Cannon says the initiative began about six months ago with a conversation among Verizon, MTIA, and ICSA Labs to see how they could improve clinical data and documentation collectively. The consortium foresees Verizon developing the digital highway while other members work together to create a relevant, usable, and codified modality for information exchange. MTIA CEO Peter Preziosi, PhD, CAE, says the basic principle is to link different transcription platforms to enable digital records to be shared among healthcare entities. To illustrate the magnitude of the impact establishing standards could have, the MTSC conducted an informal survey of its charter members regarding the number of documents processed annually. “The survey showed that our members generated 60 million narrative patient notes annually, encompassing 2.5 billion archived patient records and representing 375,000 unique physicians, 2,500 hospitals, and 2,400 clinics,” says Preziosi. By enabling the conversion and exchange of narrative notes, the initiative hopes to accelerate EHR adoption while also maintaining interoperability, security, and the integrity of the medical record. The MTSC’s initiative is also in line with federal goals to implement EHRs in a timely manner. In working on policy with the current administration to define the meaningful use of EHR components, MTIA has stressed the importance of including components at the granular level for practical use, among them narrative notes and clinical data. “There is information that is valuable and vital to have in relation to clinical care of a patient. When a physician has access to that sort of immediacy of information, it reduces the wait time for treatment,” says Cannon. The MTSC is committed to creating a standardized transaction set. To meet this goal, ICSA Labs, with its expertise in cyber security, will ensure that digital records are transmitted in a safe, secure manner. “We are working with the Health Story Project to develop standardized document formats with the ideal goal of transporting these standard report formats on this health information exchange platform, as well as to create a standardized interfacing solution for EHR vendors and transcription companies,” says Preziosi. He says having standardized interfacing solutions will keep costs in check, provide a solution for struggling regional health information exchanges, and provide better clinician access to more robust health data. Cannon believes the standard will help ease the burden of IT personnel in the clinical setting. “We know we can’t be all things to all people, but we are attempting to be encompassing enough to provide an industry standard for widespread use yet narrow enough for the individual user,” he says. By incorporating a multidisciplinary approach, the MTSC hopes to ensure it creates a standard that provides key data elements while maintaining practical usability requirements. 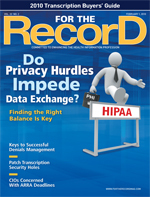 “While we are ultimately concerned about supporting the end-user clinician in optimizing patient care delivery through improved data capture and delivery, IT personnel will benefit by improved record delivery satisfaction from physicians who are challenged with both capturing and obtaining relevant clinical information in today’s current systems,” says Preziosi. In addition, because the standards are HIPAA compliant, he believes it will be easier to catalog the way records are being used. At press time, the consortium was aiming to have a prototype of technical specifications ready to show the administration by the first quarter of this year. In the long term, the goal is to have most, if not all, transcription companies working collaboratively with EHR vendors and health information exchanges nationwide to deliver their services through this information portal. Nuance Communications, Inc recently engaged more than 17,000 physicians in a survey to learn about their hopes and concerns with respect to HIT, as well as to gauge their understanding of developing healthcare government policy. In late December 2009, the Centers for Medicare & Medicaid Services, along with the Office of the National Coordinator for Health Information Technology and Health and Human Services (HHS), released proposed rules regarding EHR meaningful use standards. As the Health IT Policy Committee works to finalize the meaningful use definition, Nuance’s survey found there is concern that too much emphasis will be put on data capture and quantitative measures alone vs. the capture of qualitative information that helps tell each patient’s unique health story. There is also concern over the long-term impact of the HITECH Act. When physician respondents were asked how concerned they are “about losing the unique patient story with the transition to point-and-click (template-driven) EHRs,” 96% voiced concern, reinforcing the need for patient health records to be created using a combination of structured and narrative information. Ninety-four percent said that “including the physician narrative as part of patients’ medical records” is important or very important to realizing and measuring improved patient outcomes. As part of the survey, respondents were also shown two versions of a deidentified patient’s note (history of present illness, also known as the HPI note), which was shared by R. Hal Baker, MD, chief information officer at WellSpan Health (see below). The first note was created by a doctor describing the patient encounter and care plan in narrative form through the use of speech recognition technology. The second note on the same patient for the same visit was created using an EHR point-and-click template based on the structured elements selected by the doctor.